Among the massive cluster of games that get released each day, only a fraction of them are ever really worth playing. Shrouded by the fodder, Creepy Castle is one of those hidden gems. Imagine Mario Party or WarioWare, then give it a retro coating and a quirky and outlandish plot; that is basically what this game is giving you, and it’s actually pretty good. It takes the silliness of games like Earthbound, and the old-school feel of classic RPGs and then puts an extravagant twist on it. Lo and behold, you get something fun and refreshingly unique. If a game is a cake and its story is its frosting, Creepy Castle definitely has a sweet spread of chocolate buttercream. Plot and setting are all about flavoring your game, but also getting players invested into the world. Throughout my play through, I embarked on an epic but light-hearted adventure. I also met a variety of fun, off-the-wall creatures and battled a lot of enemies that I enjoyed way too much to kill. Eventually, the narrative starts to become multi-faceted, especially once you play the perspective of other peculiar characters involved in the tale. Miscellaneous details about the world are presented to the player in found journals and manuals. Other information and flavor text can be found in dialogues; they're also fun to read and give helpful tips. Overall the writing is clever but sometimes tries too hard. Regardless, I would say that what I experienced was a fanciful and exciting adventure with a subtle yet sinister tinge of the unknown. Another thing Creepy Castle does well is combat. It’s a simple turn-based system that consists of a variety of quick-time events and mini-games, and it’s surprisingly engaging. The combination of casual party game and retro RPG really hit a home run with me. It’s amazing how fun mashing left and right or pressing a sequence buttons can be, and Creepy Castle gets even more creative with it. Everything is fast-paced and well timed. It keeps the thrill without being frustrating. It reminds me of Undertale, taking a simple battle mechanic, doing crazy things to it, and turning it into something exciting. Exploration and controls are given to you 2D side-scroller style. When it comes to the layout, think of a Metroidvania game — a vast network of platforming rooms with plenty of areas to re-visit and unlock further content. 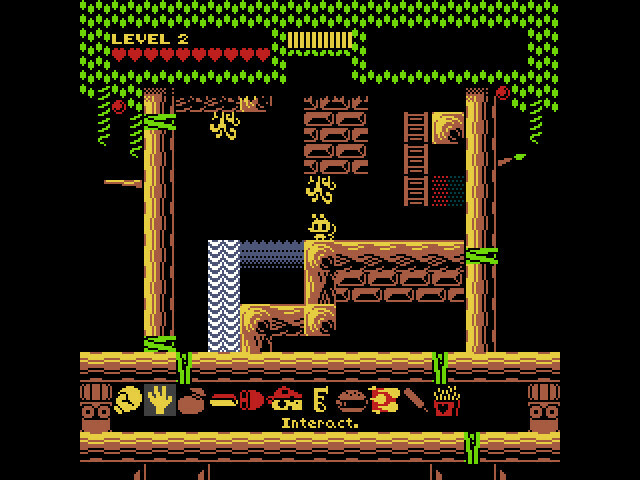 Creepy Castle also add various traps and platform devices to make moving around more dynamic. There are also plenty of different types of rooms and interactions that crowd the map, including a dance room where you step to the beat of a tune to heal yourself. If you end up giving Creepy Castle a try (which you should), make sure that you keep the music; it would honestly be a shame to miss out on the catchy chiptunes. There are a variety of level tracks that set an uppity tone and battle themes that will get you actually hyped during a boss fight. And it’s also just as impressive visually. Screenshots do not do it justice, so check out a gameplay trailer because it looks a lot better in real-time. It sports a minimalistic but aesthetically pleasing throwback to the early NES era, which definitely has a nostalgic and vintage charm to it; the pixel art is clean and concise. Despite my ravings, I have a few minor complaints. For example, there is a lack of graphical customization. 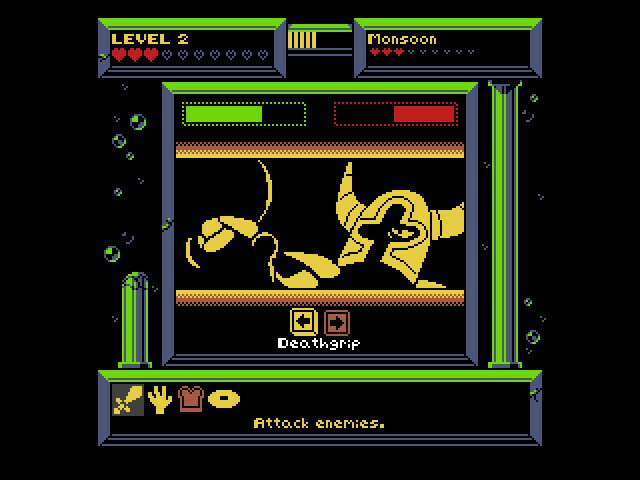 It’s not really serious since the game uses a simple art style, but the game is locked into window mode with a set resolution. I’d prefer to have more options on this end. Another issue is that the game is clearly intended for play using the controller, so there is less functionality to playing with a keyboard. Still, it works because the key-binding layout is pretty minimal. These can be easily fixed through patches, and are by no means barrier to gameplay. If all of this sounds like its right up your ally, don’t hesitate to check it out for the moderately inexpensive price point of fifteen bucks. Creepy Castle feels like it’s complete and was handled with love, which is something missing from most of the heartless Early Access titles and throw-away projects nowadays. It just hit all the right notes with me: quirky but meaningful plot and characters, elegant retro art and sound, and simple but engaging exploration and combat.